Preheat oven to 350 degrees Fahrenheit, and prepare cake batter. Bake 4, 7 inch layers for about 38 minutes. Once removed from the oven, carefully run a small offset spatula around the perimeter of the pan, to separate the layers. Let these cool for about 10 minutes, then carefully remove them from the pans and place in the freezer for about 45 minutes (accelerates the cooling process). While the layers bake and cool, prepare the buttercream frosting. Beat the butter on medium speed for 30 seconds with a paddle attachment, until smooth. Slowly add in the powdered sugar, 1 cup at a time. Add the heavy cream half way through. Once fully mixed, add in the vanilla and salt, and beat on medium low until the ingredients are fully incorporated, and the desired consistency is reached. If the frosting is too thick, add in cream (1 teaspoon at a time). If the frosting is too thin, add in more powdered sugar (quarter of a cup at a time). To watch a full tutorial on how I make my frosting, you can click here. 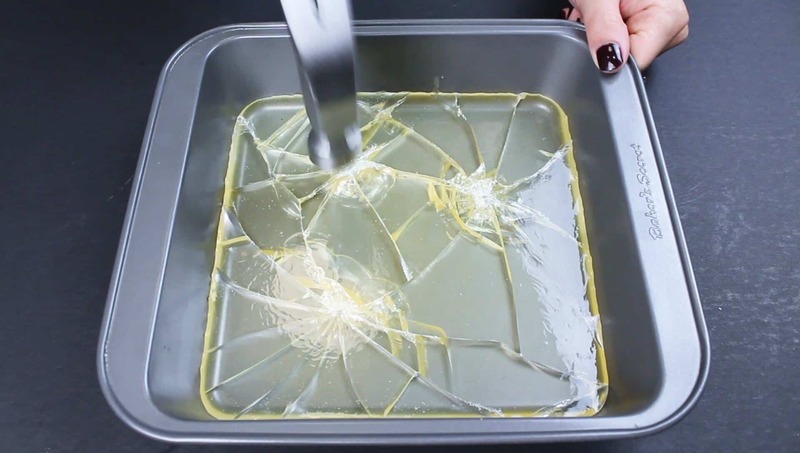 To make the edible glass shards, mix 1 cup water, 1/2 cup corn syrup, sugar, and cream of tartar in a large saucepan or pot. Bring mixture to a boil. Use a candy thermometer and boil sugar syrup until temperature reaches 300 degrees, stirring constantly. It’s super important that you get the mixture to exactly 300 degrees, and immediately remove from the heat one it does. If it doesn’t reach this temperature, it won’t fully harden, and you won’t be able to smash it into smaller shards. If it gets hotter than this, or if you don’t stir if constantly, the mixture can begin to caramelize and gain a yellowish hue. When sugar reaches 300 degrees, quickly pour onto a metal baking pan. Cool until completely firm to the touch. Break into “shards” using a hard object (I sterilized a hammer for this, but a meat mallet would work too!). Remove the layers from the freezer, and use a 3 inch circle cutter to remove the centers of two of the layers. Begin assembling the cake using an uncut cake layer. Frost with an even layer of vanilla buttercream, then top with one of the cake layers. 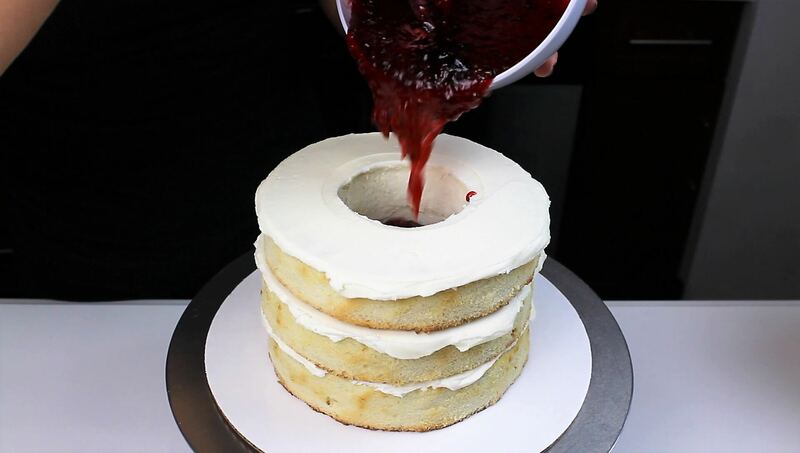 Gently frost the cake ring, the stack with the other cut layer. Spread an even layer of buttercream on top of the second cake ring, then smooth frosting into the cut-out center of the cake. 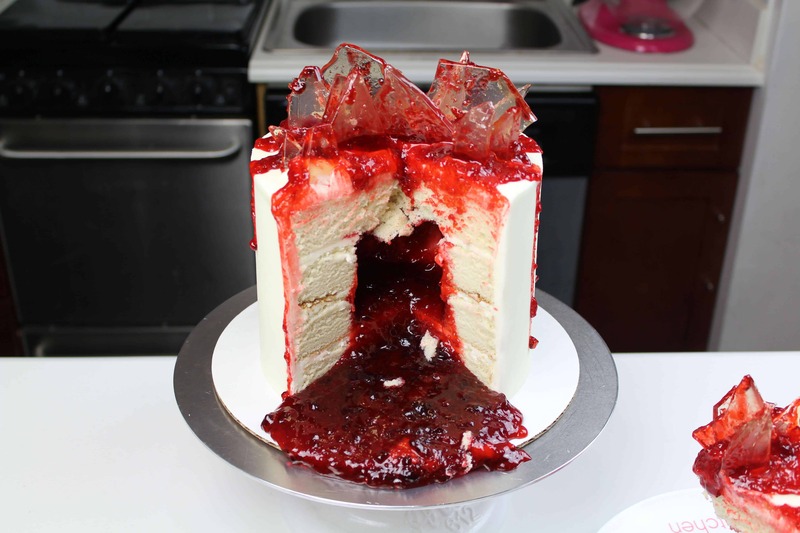 Mix one squirt of red gel food coloring into the strawberry jam, and then carefully pour into the center of the cake. Fill to the top, then place the last cake layer on top. Cover the cake in a thin crumb coat, and chill in the freezer or fridge for about 5 minutes. Once the crumb coat is firm to the touch, add a second, thicker layer of frosting. Smooth using a bench scraper. You can see a full tutorial on how to frost a cake with smooth sides here. Stick glass shards into the frosting on top of the cake, and then drizzle some of the remaining red jam between the shards. 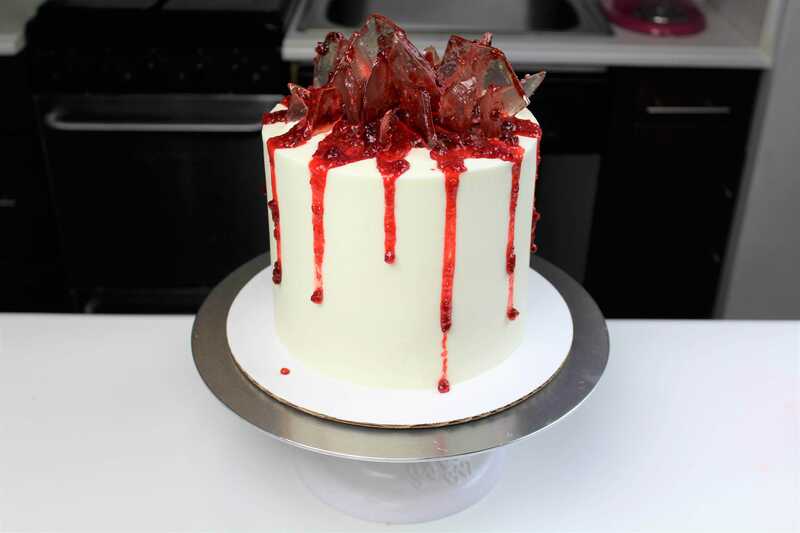 Then gather everyone around, and cut into the cake for a gory site!! it’s just a pinch! a very small amount, i’d say a few grams! Another question, what can I use instead of light corn syrup. I saw on websites that you can make sort of the same ingrediënt by water and sugar or honey or water and dextro (grape Sugar). But I don’t know if it works the same or is a good alternative in your recipe? I’ve never tried any alternative, but I’d say that mixture sounds like it should work! Can this cake be made in a 12c bundt pan instead of a layer cake? I’ve never actually tried it! it caramelized quite a bit though, so I’d be nervous it might have a very crisp outer layer!! How far in advance can you make (and place) the sugar glass?